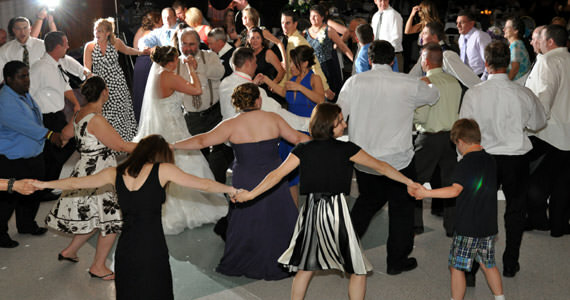 On Saturday May 30th 2009 we were at Highfield Hall in Butler, PA for a wedding reception. Our clients were Brad and Bethany Knapik of Grove City PA. The event started shortly before 5:00 pm as guests began arriving from the wedding ceremony which was held at St. Anthony’s in Forrestville. 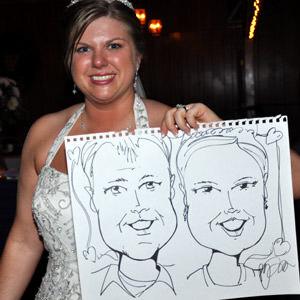 During this time, several guests had caricatures made for them by a caricature artist that Brad & Bethany had hired for the evening. 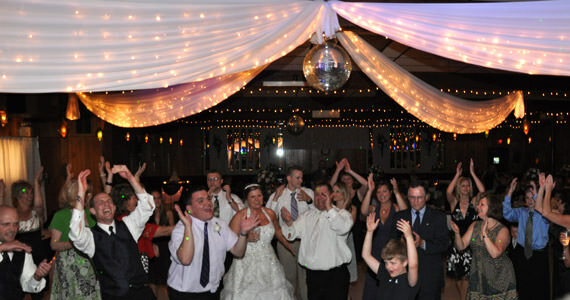 At around 6:00 pm the newlyweds and the bridal party arrived to the banquet hall in a custom “Party Bus”. The fun and laughter was pouring out of the bus before the doors even opened. 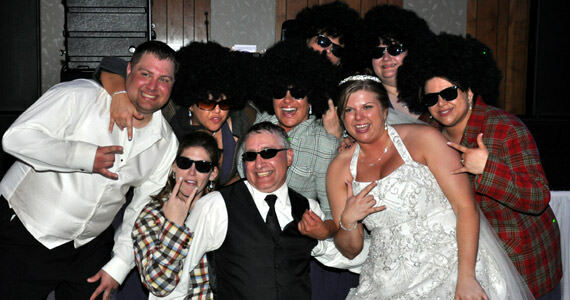 Shortly after they arrived, we got the bridal party introduced and Brad & Bethany then played “The Newlywed Game”. From there it was time to eat. Releasing tables to the buffet for dinner is normally done by just randomly picking tables one by one. However, during our planning session, Bethany asked if we would be able to do something a little different to release tables. I suggested a game that we like to play where we ask the guests questions about the bride & groom. Be the first one to answer the question correctly and your table goes to the buffet next. Get the answer wrong and you must wait. 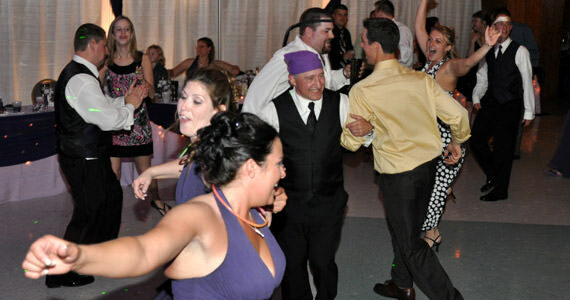 After dinner, things got started off with an old Italian wedding tradition known as a “Cake March”. The Cake March consisted of the bridal party, the parents and the bride & groom and was performed to the “E.I.O. Polka” by Frankie Yankovic. After dinner Brad & Bethany shared in their first dance as husband and wife, followed by a dance with the bridal party. 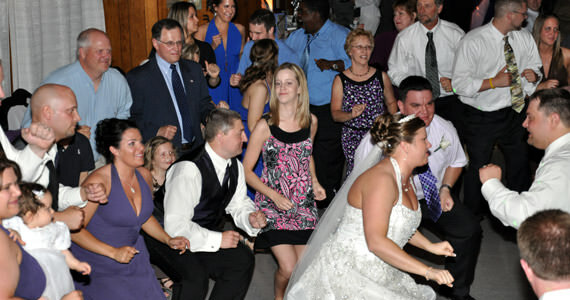 Next, our newlyweds opted to hold a “Good Luck Dance”. 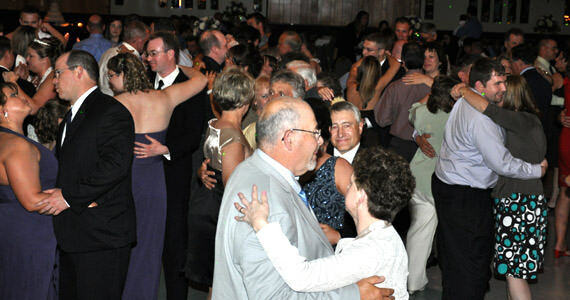 The Good Luck Dance is based on the premise that for every couple on the dance floor, Brad & Bethany will have an additional year of good luck. If this holds true, our couple will share many, many happy years together. 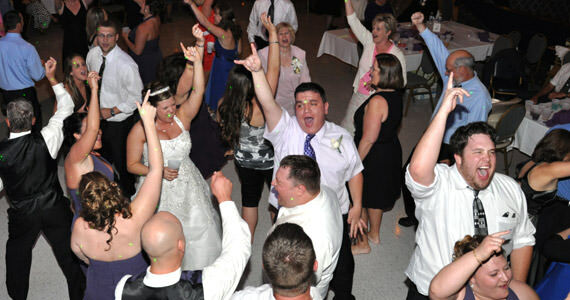 We then opened up the dance floor and the real party started. Shortly there after, we held a Teddy Bear Toss for the younger boys & girls and then the Bouquet & Garter Toss for the single ladies and gentlemen. 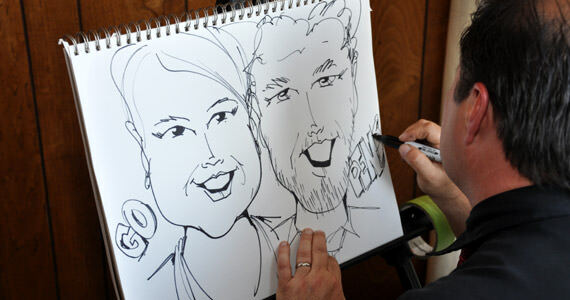 Brad & Bethany had requested a very interactive event. 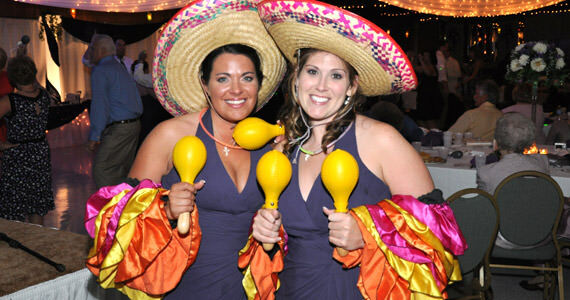 They wanted to be sure we got people involved and even wanted to include a contest for the groomsmen. For the contest, they chose one of our favorite games “Walla Balla”. 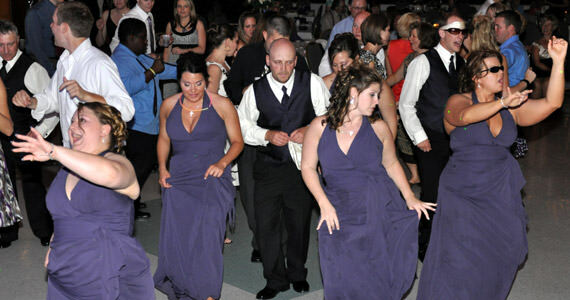 They also had us use the bridesmaids in a little skit we call “Pure Funk”. 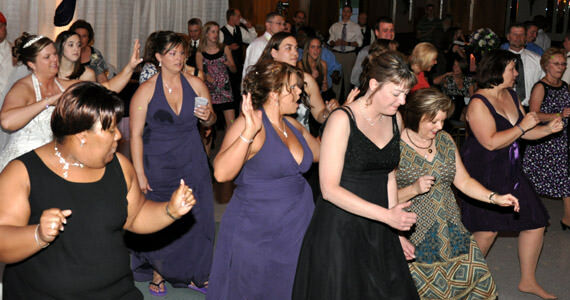 We dress them up in large Afros, Plaid Sport Coats & Cool Sunglasses and they dance with guests to “Play That Funky Music White Boy” by Wild Cherry. 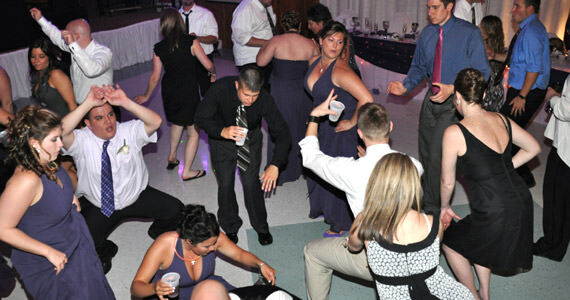 Needless to say; with the tremendous amount of interactivity, there was never a dull moment at this wedding reception. The event wrapped up at 11:00 pm with Gay DeMarsh (mother of the bride) “Unveiling” Bethany and then everyone dancing the last dance to “Feels Like Home” by Chantal Kreviazuk. You can instantly see if we are available to perform at your event, by entering the date of your event below. 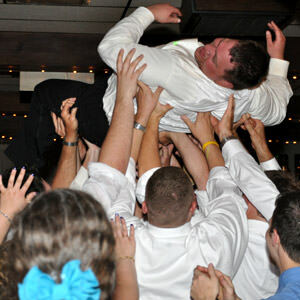 Pifemaster Productions is a disc jockey entertainment company serving the Pittsburgh area. 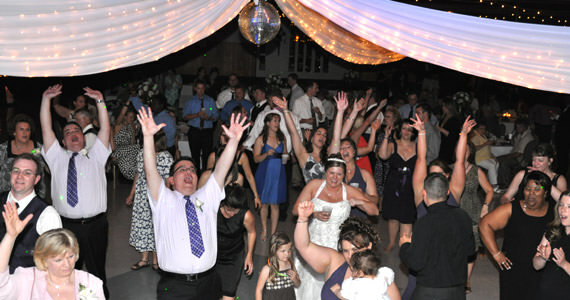 We provide disc jockey entertainment and up-lighting rentals for wedding receptions, wedding ceremonies and Bar Mitzvahs. Don’t just take our word for it. 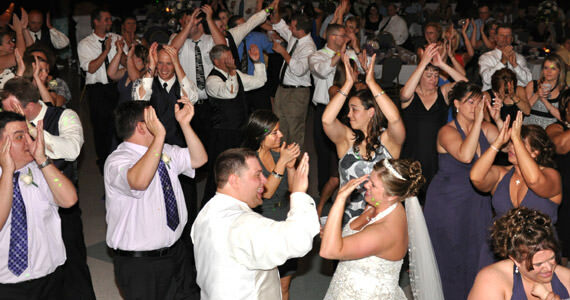 Check out the hundreds of reviews online from former clients and you will clearly see why Pifemaster Productions is the most sought after wedding DJ in the Greater Pittsburgh area.